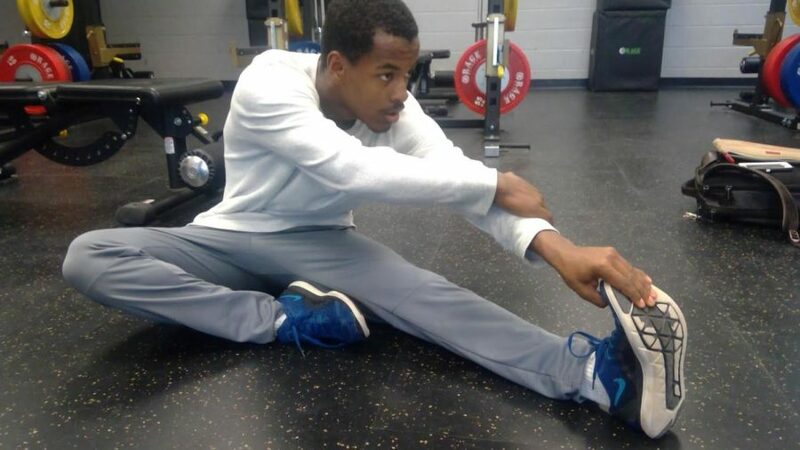 After getting a surgical repairment for his labrum, Minassie Larson '22 stretches out in the weight room after school. Larson had surgery on his hip because he was tackled during a Freshman Football game. "I couldn't run-it's my favorite thing-I had to look at every day as a still image-I could never move," Larson said. During the freshman team’s fourth game, Minassie Larson was tackled in the last quarter of the game against Fair View High School. Larson thought it was just a strain and stretched before going back out onto the field. Little did he know, this tragedy would impact the rest of his high school football career. Minassie Larson was already dealing with hip-overgrowth problems and a bone chip but getting tackled made it so much more difficult. The bone chip was tearing off his labrum and cartilage before he was tackled. Larson had to undergo a three hour surgery where they had to shave off the bone and repair the labrum. Even though the surgery was scheduled for two hours, it lasted for four hours all together. Larson was non-weight bearing for three weeks and in a hip brace before he was put on crutches for another three weeks. After three months, Larson could start working out again. But in the time he was bedridden, Larson’s teammates came to visit him in the hospital. “We all went to see him when he got out of surgery. It felt great because when anyone is on anesthesia, they are super funny,” Camden Messenger ’22, Larson’s teammate, said. As well as Minassie’s mom, Sherry Larson who stayed with Minassie throughout the night. “It was a lot of ‘care’ for a few days because he couldn’t walk and as in a lot of pain. The hardest part was seeing how bummed out he was about not being able to play. Now it’s hard trying to remind him he can’t run and jump yet,” Sherry said. Since he had to miss out on two weeks of school, this took a toll on his first semester grades. It was also hard to carry his stuff around when he was on crutches. Through all the pain, Larson has had to go to physical therapy three times a week, his family wasn’t able to go anywhere for the holidays and it was hard to plan winter activities. However, this gave Minassie time to work on his video game skills. Larsons scheduled refurbishing for physical training is Feb. 6. Where he can work on getting his body back in shape. His doctors told him it would take eight-nine months until he was fully able to recover. Larson was granted the ability to play again in the fall of 2019.